The truth is, the top of the direct selling/network marketing system is open to everyone — unlike traditional corporate systems, which allow only one person to reach the top of the company. The reason most people do not reach the top is simply because they quit too soon. So why would someone quit short of the top? Most people join only to make money. If they don’t make money in the first few months or years, they become discouraged and quit (and then often badmouth the company and industry!). Others quit and go looking for a company with a better compensation plan, but joining to make a few quick dollars is not the reason to get into the business. Reason number one is to help yourself. Reason number two is to help others. If you join for only one of these two reasons, then the system will not work for you. Reason number one, means that you come to the business primarily to change quadrants — to change from the E (Employee) or the S (Self-employed) quadrant to the B (Business owner) or I (Investor) quadrant. This change is normally very difficult for most people — because of money. The true ‘E’ or ‘S’ quadrant person will not work unless it is for money. This is also what causes people to not reach the top of the direct selling system: they want money more than they want to change quadrants. An ‘B’ quadrant or ‘I’ quadrant person will also work for money, but in a different way. The ‘B’ quadrant person works to build or create an asset — in this case, a business system. 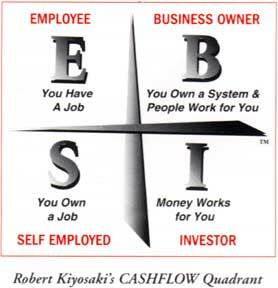 The ‘I’ quadrant person invests in the asset or the system. As a ‘B’ or an ‘I’, sometimes you don’t get paid for years; this, a true ‘E’ quadrant or ‘S’ quadrant person will not do. It’s not part of their core values. Risk and delayed gratification disturb them emotionally. Delayed Gratification and Emotional Intelligence. One of the beauties of direct selling is that it focuses on developing your emotional intelligence as well as your business skills. This is why the educational system inherent in a good direct selling opportunity is so important. It’s the emotional education or emotional intelligence aspect of their programs that I find so valuable for people. Once I have built or bought an asset, that asset works hard to make money for me. But I will not work for money – I will work only to build or buy assets. Those assets make me richer and richer, while I work less and less. That is what the rich do. The poor and middle class work hard for money, and then buy liabilities instead of investing in assets. What Kind of Asset is a Direct Selling Business? Remember, there are two reasons to be successful in direct selling: to help yourself, and to help others. Reason number one means helping yourself get to the ‘B’ side of the quadrant. What about reason number two? The beauty of most direct selling systems is that you don’t really make much money unless you help others leave the ‘E’ and ‘S’ quadrants and succeed in the ‘B’ and ‘I’ quadrants. If you focus on helping others make this shift, then you will be successful in the business. If you only want to teach yourself to be a ‘B’ quadrant and ‘I’ quadrant person, then a true direct selling system won’t work for you. You may as well go to a traditional business school, which focuses only on your becoming a ‘B’ quadrant person. The beauty of a direct selling business is that your goal is to create assets, which are other ‘B’s working under you — and their job is to create other ‘B’s working under them. In traditional business, the focus is for the ‘B’ to have only ‘E’s and ‘S’s working for them. The type of business I was taught to build is a business with me at the top and ‘E’s and ‘S’s at the base. I really don’t have room at the top for many other ‘B’s, which is why in my businesses, I strongly recommend that all my employees look into direct selling as their own part-time business. The traditional corporate system really is a pyramid, because there are a few ‘B’s and ‘I’s near the top, and more ‘E’s and ‘S’s at the base. 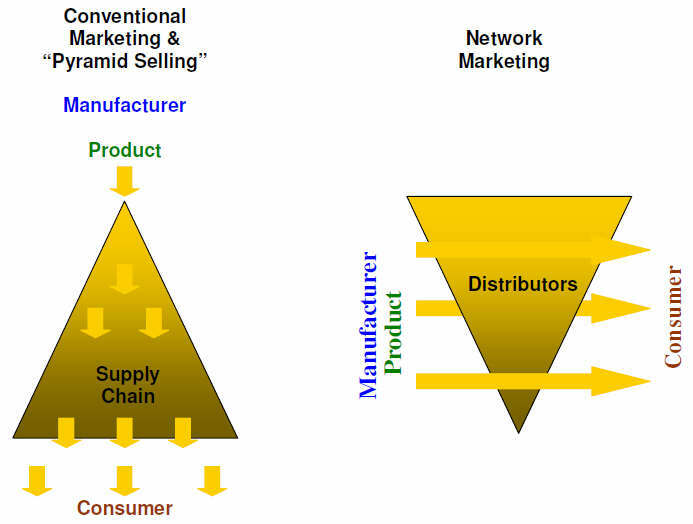 A direct selling/network marketing system is a reverse pyramid: its primary focus is to bring more and more ‘B’s to the top. Subtitled, “The Eight Hidden Values of a Direct Selling Business, Other Than Making Money” this is Kiyosaki’s outstanding explanation of the real power of networking in general, and direct selling specifically. In it he describes one of the most powerful and legitimate business industries around today, and why so many of its best aspects teach you what the rich already know: Networks are one of the best ‘B-quadrant’ business tools, and quickest wealth building forces in existence! Together with “Cash Flow Quadrant” this is a must read. Quadrant”; “Rich Dad’s Guide to Investing”; and “Rich Kid, Smart Kid”. He is an internationally recognized speaker and teacher on the subject of money. J.P. Morgan declared, “‘Rich Dad, Poor Dad’ a must read for millionaires” as reported in the Wall Street Journal, and USA Today called ‘Rich Dad, Poor Dad’ “a starting point for anyone looking to gain control of their financial future.” He and his wife are also very happy Juice Plus+ customers.